These Customized Belgian Beer Glasses feature any design you choose on one side of each glass. Five and a half inch tall 13 Ounce Custom Belgian Beer Glasses (#13807) and six inch tall 16 Ounce Custom Belgian Beer Glasses (#13808) are available. Our Belgian Beer Glasses are made using a kiln-fired imprinting process at heats that reach as high as twelve hundred degrees. This process helps to ensure that your imprints are durable and long lasting. The minimum order is just 72 Customized Belgian Beer Glasses. You will receive your Custom Belgian Beer Glasses about 3 to 4 weeks after you place your order. Rush production and/or expedited delivery is available. Your satisfaction is guaranteed when you order custom glassware from us. Please call us toll-free at 1-800-233-0828 for additional information or to order your Custom Belgian Beer Glasses. 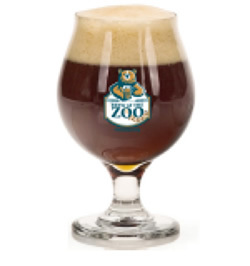 Pricing* for Custom Belgian Beer Glasses – Call 1-800-233-0828 for more info or to order! 13807 13 oz. Custom Belgian Beer Glass with a one-color imprint $3.55 $3.15 $3.09 $3.03 $2.95 $2.91 1-1/4" 3-1/2"
13808 16 oz. Custom Belgian Beer Glass with a one-color imprint $3.59 $3.19 $3.13 $3.07 $2.99 $2.95 1-1/4" 3-1/2"
*For Custom Belgian Beer Glasses with a Full Color Decal (as pictured above), please call 1-800-233-0828. Ordering your Custom Belgian Beer Glasses is easy. Please call 1-800-233-0828 and submit your camera-ready artwork to graphics@kardwell.com (you can also mail or fax your art to us). For additional information on any of our Custom Imprinted Glassware, please contact us 1-800-233-0828.